A former policeman told the Hague trial of former Serbian State Security chiefs Jovica Stanisic and Franko Simatovic that the service’s Red Berets unit expelled Bosniaks from eastern Bosnia and burned their villages. The witness, whose identity was protected, told Jovica Stanisic and Franko Simatovic’s trial at the Mechanism for International Tribunals in The Hague on Tuesday that he took part in a raid in Bosnia and Herzegovina in March 1993 as a member of the Serbian interior ministry of special police unit. He claimed that his unit was sent to assist the Red Berets. When they arrived in Bosnia and Herzegovina, they were told that they were to be “part of the Red Berets which were part of Serbian State Security” and run by Simatovic. “They told me they were the reserve force of Serbian State Security,” said the witness, who was codenamed RFJ-083 by the UN court. The witness claimed the Red Berets “cleared Muslim villages” in the Podrinje area of eastern Bosnia, burning them to the ground so that “Muslims would not return”. “The purpose of burning the houses was to expel the population and clear them out, considering they represented a threat to Serbs after the attacks of [Bosnian Army commander] Naser Oric and his units,” said the witness. Oric was tried in The Hague and acquitted of war crimes against Serbs, and is currently on trial in Sarajevo. The witness said he learned from other members of his unit that the Red Berets killed a disabled person in his bed in one of the villages because the man could not run away like the other Bosniaks. He also said that members of the Red Berets stole from abandoned Bosniak houses. According to the witness, Yugoslav Army tanks also assisted the operation in Podrinje, and fired artillery weapons on villages near Skelani before the Red Berets and police units from Serbia entered. “I assume the logic behind the artillery attacks was to allow us to move forward and to move part of the population without having to fight anyone,” said the witness. Before he was sent to Bosnia and Herzegovina, he and other members of the Serbian interior ministry special police unit were trained by Red Berets members at Tara in Serbia. He also testified that he was told, if captured, to deny he was from Serbia, but to claim he was part of special police force from Banja Luka in Bosnia and Herzegovina. 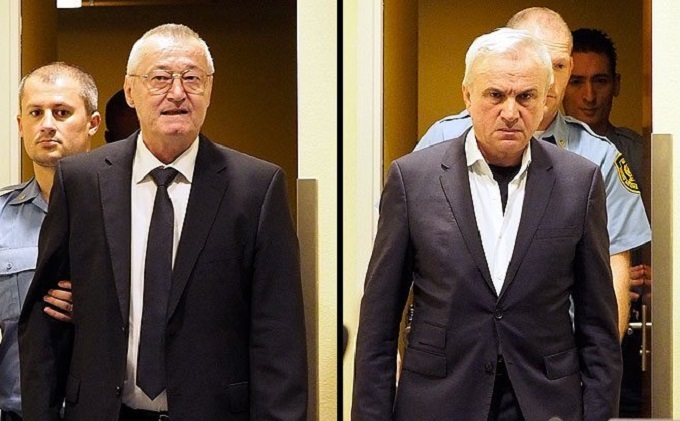 Jovica Stanisic, the former chief of the Serbian State Security Service, and his former assistant Franko Simatovic are on trial for persecution, murders and deportations during the wars in Croatia and Bosnia and Herzegovina. According to the charges, the Red Berets were under the control of the Serbian State Security Service. The indictment alleges that Stanisic and Simatovic committed their crimes as part of a joint criminal enterprise aimed at forcibly and permanently removing Croats and Bosniaks from large parts of Croatia and Bosnia and Herzegovina, which would then be incorporated into a unified Serb state. They both pleaded not guilty in December 2015 after the appeals chamber of the International Criminal Tribunal for the Former Yugoslavia overturned their acquittal in their first trial. The appeals chamber ruled that there were serious legal and factual errors when Stanisic and Simatovic were initially acquitted of war crimes in 2013, and ordered the case to be retried and all the evidence and witnesses reheard in full by new judges.